The fighter jets and military planes that blast into the skies each day above Albuquerque’s Kirtland Air Force Base (KAFB) consume millions of gallons of jet fuel each year. In order to serve this fleet, the Air Force stores enormous amounts of fuel and distributes it throughout the base via a network of tanks, pipes and pumps. In the early 1950s, the base replaced leaking tanks and aging pipelines with a new fuels facility it promised would modernize and make more safe the handling and distribution of jet fuel. The facility received its first trainload of jet fuel and aviation gas in 1953. Almost immediately, and for the next 45 years, it has leaked jet fuel into the surrounding soil. The “leak” continued, undetected, until 1992 when workers observed a huge surface plume in the soil surrounding the fuel facility. The Air Force largely ignored requests by the US Environmental Protection Agency (EPA) to investigate the plume’s source and extent and instead, in 1994, gave itself a waiver from conducting military-mandated tests of the facility pipeline. Under pressure from the New Mexico Environment Department (NMED), the Air Force finally conducted pressure tests of the pipelines in 1999. They failed spectacularly. The added pressure blew massive holes in the pipeline. The test appeared to prove the pipes were leaking. In a comic/tragic, nothing-to-see-here moment in May 2000, Mark Holmes, a civilian project manager for Kirtland’s environmental unit, told the Albuquerque Journal that everything was fine: The 100,000 gallons of missing fuel could be explained by a simple accounting error. NMED staffer Dennis McQuillan, however, told the Journal that if it were a 100,000 gallon spill, it “would be a big spill, one of the biggest” in state history. They were both wrong. In 2006 an Air Force contractor drilled an exploratory well in southeast Albuquerque’s Bullhead Park, just outside the base's northern boundary. He found four feet of jet fuel floating on top of the aquifer. Additional monitoring wells found a plume of jet fuel slithering northeast from the original spill location and well beyond the northern boundary of the base. Kirtland estimated the plume at between one and two million gallons, but NMED raised that estimate to eight million gallons. Two years later, with more monitoring and evidence of the true scale of the spill, NMED revised the estimate dramatically to 24 million gallons, an amount 240 times larger than the 2000 estimate. For comparison's sake, the KAFB spill is larger than the 1989 Exxon Valdez spill, which dumped more than 12 million gallons of crude oil into Alaska’s Prince William Sound, killing an estimated quarter-million seabirds, 3,000 otters, hundreds of harbor seals and bald eagles and nearly two dozen killer whales. The KAFB jet fuel spill—the Air Force calls it a “leak”—is the largest toxic contamination of an aquifer in US history, and it could be twice the size of the Exxon Valdez disaster. And that’s bad enough, but it’s the good news compared to what follows. Unlike the crude oil in the Exxon Valdez disaster, jet fuel and aviation gas contain a variety of toxic chemical compounds, including benzene, toluene and various aliphatic hydrocarbons, and these are all found in the plume—in varying concentrations—at every depth. Among the toxic chemicals contaminating the aquifer, one poses the most serious threat to both human health and the challenge of remediation: ethylene dibromide or EDB. The EPA banned the commercial and industrial use of ethylene dibromide more than 40 years ago. Prior to its ban, the US produced 300 million pounds of EDB annually, with most used as an additive in leaded gasoline. Every gallon of aviation gas included enough EDB to contaminate millions of gallons of drinking water. In addition, 20 million pounds of EDB was used each year as an agricultural fumigant. Nearly 40 crops were routinely sprayed with EDB. Farmworkers—often with little or no protective equipment—fumigated fruit and citrus trees. They sprayed it on stored grain and the milling equipment that made the bread that stocked grocery store shelves. They saturated soil with EDB after harvests. When EDB is released into soils, it almost always makes its way into groundwater. It is highly soluble and stable and persists in soils and underground water. It’s hard to find and even harder (and more expensive) to get out. By the early 1970s, concerns about EDB’s risk to human health surfaced after laboratory tests of rodents identified it as a potent carcinogen and mutagen. In 1973 the United States Environmental Protection Agency (EPA) issued regulations that led to the reduced use of leaded gasoline—and thus EDB—but the agency continued to allow agricultural use of EDB. The National Cancer Institute first issued a notice on EDB in 1975, reporting that it induced cancer in laboratory animals. Following that warning, EPA conducted a six-year review, culminating in September 1983 when it suspended all agricultural uses of EDB pending further scientific study. Laboratory tests quickly confirmed previous reports that EDB caused cancer and reproductive disorders in laboratory animals. Meanwhile high concentrations of EDB were found in drinking water in California, Florida, Hawaii and Georgia. The EPA issued an emergency ban on all agricultural use of EDB in February 1984. In the wake of the ban, more studies examined EDB's effect on animals. In some laboratory animals, EDB is a reproductive toxin. It inhibits the ability of rats, rams and bulls to produce sperm, and it interrupts the fertility of fowl. It binds itself to DNA and rewrites genetic information causing mutation. It is a potent carcinogen in rats and mice. When exposed to skin, it produces widespread lesions and tumors; when given orally, tumors develop in the stomach and lungs. Inhalation results in tumors in the nasal cavity and circulatory system. Untold thousands of laboratory animals were killed by exposure to EDB; this, in order to show that EDB is fatal in high doses while low-level longterm exposure causes renal and liver failure, cancer and mutation. Its effect on humans is more difficult to determine. The HERP index, a measure that translates cancer risks in rats to humans, ranks EDB as the most dangerous rodent carcinogen to human health. Toxicologists differ on whether the data on human mortality to EDB is statistically significant. A 1990 study by the California Department of Health Services found that citrus workers “had essentially a 100 percent chance of contracting cancer.” A 1984 study published in the Journal of the American Medical Association reported on deaths of two agricultural workers: One worker died of liver failure 12 hours after collapsing while cleaning inside an empty tank, found later to contain EDB residues; another worker died of renal failure 64 hours after trying to rescue the first worker. A 1980 mortality study of 161 workers employed at two EDB manufacturing plants—including one owned by Dow Chemical—identified a pattern of malignancies and exposure fatalities among workers, but also concluded mortality was lower than expected given human risk assumed by animal studies. In other words, EDB causes fatal renal and liver failure in high doses, and it's a human carcinogen in low-level, longterm exposure, but not at a rate greater than statistically expected. However, these studies were enough to convince the EPA to act. The Safe Drinking Water Act of 1974 required that the EPA determine safe levels of various chemical contaminants in drinking water. The agency determined the maximum safe level of EDB in drinking water—the level at which no adverse effects would likely occur—is zero. In other words, the EPA considers no amount of EDB in drinking water safe for human health. Despite EPA standards, NMED permits EDB in drinking water at levels at or below 50 parts per trillion (ppt). The most recent data from KAFB’s plume-monitoring wells find EDB concentrations in shallow wells on the base at concentrations of 240,000 ppt, a concentration nearly 5,000 times greater than the 50 ppt standard. Monitoring wells on and off base have found EDB in shallow, intermediate and deep wells at all depths in concentrations significantly higher than NMED’s standard. The presence of EDB in the plume at such alarming concentrations reveals two inconvenient facts for the Air Force. First, it has made it more difficult for Kirtland to minimize the significance of the spill. At a public meeting last week, KAFB Colonel Jeff Lanning admitted that “fuel has been leaking for a long time,” and since the Air Force discontinued use of leaded aviation gas in 1975, the presence of EDB suggests the spill began “possibly as early as the 1950s.” Current estimates suggest a plume of EDB-contaminated groundwater 1,000 feet wide and more than a mile long is moving northeast from the base; according to a 2009 KAFB memo, it's advancing as much as 385 feet per year. Most of that plume—80 percent of which is now beyond the boundary of the base—is headed directly for the Ridgecrest neighborhood. The Albuquerque Bernalillo County Water Utility Authority operates a series of wells in the Ridgecrest area that pump so much water for the city that they produce a cone of depression that acts like a straw, sucking the plume ever closer. Second, the chemical properties of EDB make it as elusive as it is dangerous. Its solubility means that it dissolves easily in water and thus separates from aviation gas and quickly contaminates aqueous systems like underground aquifers. Its chemical stability means that it doesn’t easily biodegrade. 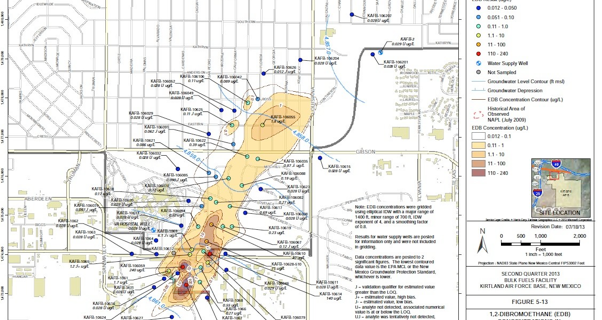 Figuring out how much aviation gas KAFB spilled and how much EDB is in the aquifer is therefore important information. But the Air Force doesn’t really seem to care. When asked at a community meeting how much jet fuel spilled, Lanning dismissed the question. “When my kid spills Kool-Aid on the carpet, I’m less concerned about how much he spilled than I am about how to get it cleaned up.” Lanning’s glib dismissal of the size of the plume might reflect less a folksy charm and more a calculated public relations stance. If KAFB can take the focus off the spill's size, it can be represented as a simple remediation project rather than an environmental disaster. And so the Air Force distributes maps of the plume at public meetings—maps that confidently depict EDB far from municipal well fields. But decades after the spill, the Air Force has yet to model the hydraulic properties of the aquifer. And so these maps—overconfidently representing a reality we can't know—are more reassuring fiction than sound hydrological science. If in the decades EDB lurked in the aquifer, it migrated into existing drinking water wells, we wouldn’t know. There is no medical test to determine human exposure and none of the drinking water wells have the technical capacity to meaningfully measure levels of EDB.